July 26, 2005: It began raining at 11 am. In the next 24 hours, India's most populous city received 944 mm of rainfall. The resultant flood killed 450 people (officially), and caused financial damage worth about Rs 4,000 crore. For three days, the water didn't recede. August 2005: Fever, malaria, dengue, leptospirosis, diarrhoea, cholera. Inquiries, press conferences, public hearings, committees, commissions, terms of reference. Mumbai is back to normal. But Mumbai is asking: how did it happen? Why? nidhi jamwal examines these questions in great detail. The flood was foretold. The disaster, in all its dimensions -- perhaps not the scale -- was already mapped. For years now, Mumbai's politicians -- of all hues -- have ignored the signs: the crumbling drainage system; the built-over natural drainage; the poisonous landfills where garbage stands 8-10 metres high, exuding poison; the untreated sewage, shamelessly dumped into the Arabian Sea. Post 26/7, will anything change? Might not. For like the flood, one kind of future for the city has also been foretold. Says Transforming Mumbai into a World-Class City: First Report of the Chief Minister's Task Force: "Our vision is for Mumbai to possess, by 2013, the twin elements of a world-class city: dynamic, job-creating growth and a comfortable quality of life. Our ten-year vision is for Mumbai to be globally distinctive in economic growth and healthcare, and to be in line with global best practice in other parameters like housing and transportation." According to the Municipal Corporation of Greater Mumbai (MCGM), Mumbai's 'official' storm water drains consist of road drains, minor nullahs, major nullahs and outfall. All are interlinked, and finally empty into either the Arabian Sea directly or into the four creeks that open into the Arabian Sea. The city is extremely privileged. It has 115 sotrm water drain outfalls. In contrast, the Western suburb has 43 and the Eastern suburb a paltry 28 -- the Mithi river carries most of the discharge from these. Also, the City system is mostly underground; the suburbs have open drains and nullah s. "Suburbs are developing so rapidly that the municipality is not able to provide proper drainage. Also, low-lying areas and old ponds have been filled to make multi-storey buildings and shopping malls. So the natural drainage system, of holding ponds and water channels, no longer exists. Flooding is but natural," says R N Sharma, head of unit for urban studies, Tata Institute of Social Sciences (TISS), Mumbai. The suburban outfalls depend on gravity to discharge rainwater: flood gates -- which close when the tide reaches 4.6 m high, or in heavy rainfall, to avoid a seawater backflow -- are located only at Love Grove, Worli; Cleveland Bunder, Worli; and Haji Ali. This is why most low-lying suburban areas experience annual floods. Moreover, "At many places seawater has intruded into the city through stormwater drains and corroded pipelines. Sometimes it even shakes multi-storey buildings," says Girish Raut, a Mumbai-based activist. Mumbai's drainage problem is completely an effect of construction- and reclamation-mania. Explains Gupta: "The quantity of water falling on the city has not decreased, but the space to flow has, tremendously. Earlier, almost 50 per cent water would seep into the ground, drastically reducing the total volume to be managed. But today the whole city is cemented. Hence, whenever water falls, the ground cannot absorb it. Most nullahs and drains are encroached upon and choked. They, too, cannot tackle so much water." There is no local practice of stormwater management. At present, every municipality in India must follow the 1993 Manual on Sewerage and Sewage Treatment of the Central Public Health and Environmental Engineering Organisation (cpheeo) under the Union ministry of urban development. "The cpheeo manual prescribes a single capacity -- of 12 mm to 20 mm per hour flow -- for swdn throughout India, be it Jaisalmer or Mumbai. This is ridiculous. It needs to be updated," says Gupta. An swdn in any Indian city is today constructed keeping in mind peak per hour flow. Gupta believes this doesn't make sense. All calculations, he says, need to be made on the basis of 15 minutes peak flow, for in any Indian city, on average, it takes about 15 minutes for water to flow -- from where it falls -- to the nearest drain. 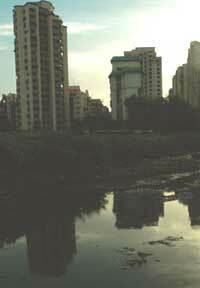 The MCGM conducted an elaborate study of Mumbai's drainage system in 1992. The Brihanmumbai Storm Water Drains (brimstowad) report recommended the following: divert dry weather flow to sewage pumping station; provide storm water pumping stations; increase drain capacity; improve floodgates; repair dilapidated drains; augment railway culverts; and deepen/widen nullahs. At that time the cost of the project, to be implemented over 12 years, was Rs 616 crore. This has now escalated to Rs 1,200 crore. Some work was started. Then everything stopped, due to lack of funds. The sewerage network, over 1,400 km, comprises 41 satellite pumping stations and seven major pumping stations -- one for each zone, each with their own sewage collection and treatment system. Sewage is collected in sewer lines through gravity and conveyed to satellite pumping stations. From here it is pumped to the main sewage pumping station (sps). The sps sends untreated sewage to a sewage treatment plant (stp) of a zone, for treatment and final disposal into the sea. mcgm, with financial support from the World Bank, is implementing an integrated water supply and sewerage project and has prepared a sewerage master plan till 2025. According to a recent paper, Sewerage operations of mcbm, by P R Sanglikar, deputy municipal commissioner, mcgm, the master plan is a five-phase programme (2005-2025) with a total cost of Rs 55,70.4 crore -- Rs 39,45.15 crore for sewerage work and Rs 16,25.25 crore for slum sanitation. The plan is under implementation. Still, untreated sewage continues to flow into the sea. Why? Marine outfall is basically a conduit to dispose sewage into the sea after partial treatment. A typical marine outfall has an influent pumping station (ips) and an effluent pumping station (eps). The former discharges sewage in normal conditions; eps comes into play during high tide. Down To Earth visited Bandra ips and eps sewage facility. The facility is on reclaimed land near the Mahim creek. Stiff local opposition delayed the plant's completion by over two decades. But since May 27, 2003, it has been functioning. The inflow of sewage here is about 600 million litres daily (mld); this increases during the monsoon. According to the sewerage operations department of mcgm the increase is due to rainwater inflow in sewer lines. But the municipality's stormwater division claims it is the raw sewage that mostly flows in the stormwater nullahs throughout the year and needs to be diverted to the sps for proper treatment. "Before this facility began, untreated sewage was emptied out in the sea through various nullah s and Mithi river. But things have changed now and fish can be seen near the coast, proving the facility's success... . Although the normal flow of sewage is up to 600 mld, the total capacity of this facility is over 2,100 mld. This will take care of additional load for the coming 15 years in Bandra zone," says V P Pandey, assistant engineer, Bandra ips facility. But things are not as rosy as mcgm would want us to believe. The treatment method followed in marine outfall facilities is rather incomplete. Firstly the floating matter (chiefly plastics) is removed using screen bars at ips . Sewage is then pumped up to the eps facility, where the floating materials are once more. "Plastics are a major problem as they form a wall against the screen bars and restrict sewage flow. This leads to grit settling in the first chamber itself, whereas it should settle in the next chamber. Grit up to 6 feet height has deposited in some chambers and we are physically removing it," says an engineer at Bandra eps facility. After screening chamber, the sewage enters the aerated grit chamber, where compressed air helps settle grit. mcgm engineers claim such aeration is tantamount to 'treatment'. The sewage is finally disposed off in the sea through a 3 km pipeline. The whole process, according to Pandey, takes eight hours. Both the floating matter and the grit is transported to Deonar dumping ground for disposal. But is the present eight-hours-aerated-grit-chamber-treatment method effective for sewage treatment? Not so, if one goes by the data of mcgm's laboratory at Dadar. According to lab reports Down To Earth (dte) chanced upon, the so-called treated effluent fails to meet prescribed mpcb standards (see table:Treated sewage?). This data is collected during the monsoon, when rainwater dilutes sewage. So what must the situation be in other months? The second method of sewage treatment mcgm uses is aerated lagoons. These lagoons are operational in Versova, Ghatkopar and Bhandup and follow a more elaborate treatment process. dte visited Versova Waste Water Treatment Facility and Lagoons (vwwtfl), at Versova near Andheri. This facility, running since 1998 and built at a cost of Rs 34 crore, has a total capacity of 180 mld of wastewater and 90 mld for lagoons. This means: the facility can receive up to 180 mld of sewage, but the lagoons can treat only 90 mld. So where does the rest go? "We have no option but to bypass excess untreated sewage straight into the [Malad] creek," admits an MCGM official. vwwtfl follows an exhaustive treatment process -- physical treatment that removes floating materials and grit, and biological treatment in lagoons that removes organic matter. Lagoons consist of six ponds. The first two ponds are aerobic lagoons whereas the rest four follow both aerobic and anaerobic processes. These ponds consist of aerators, which help microorganisms present in the sewage digest the organic pollutants. The whole process takes about four-and-a-half days to complete," says Sagar Kharde, sub engineer, vwwtfl. The results indeed are encouraging, with bod reduced to as low as 30 mg/l, tss at less than 50 mg/l, and cod as low as 80 mg/l. Treatment cost is also low, at Rs 340 per million litres. But this is true only of 90 mld. What of the untreated 60 mld to 110 mld sewage? " mcgm has two options. Either to reduce the retention time for sewage treatment or to set up more lagoons. For the latter we need more land and there is hardly any free land in Mumbai. An entrepreneur has approached mcgm with a chemical whose addition, he claims, will reduce retention time from over four days to less than a day. mcgm is testing the chemical's efficacy," says a mcgm official on condition of anonymity. The Versova facility faces other problems as well. The lagoon capacity is decreasing; one and half metre thick sludge has accumulated in the ponds that has not been removed since the facility started functioning. "The present sewerage covers only 60 per cent of Mumbai, leaving out slums and maybe some upcoming residential/commercial complexes. Efforts are on to provide sewerage facilities to these areas," says Dange. Experts claim this is a typical development syndrome most urban cities across the world are facing. "Cities are growing at such a rapid pace that basic infrastructure has failed to keep pace with it. Hence in Mumbai, more and more multi-storey buildings are coming up, whereas the municipality is not able to provide these basic services. More and more of drinking water is being sourced for Mumbai from many kilometres away, and more water supply means more wastewater. Also, many localities that do not have adequate municipal water supply depend on water tankers, so their wastewater does not count as official sewage. Again, to cut costs, many housing colonies prefer throwing their sewage into a nearby nullah rather than pay for an official connection," says Kapil Gupta, professor at civil engineering department of Indian Institute of Technology Bombay, Mumbai. Where does the sewage from 40 per cent of Mumbai go? 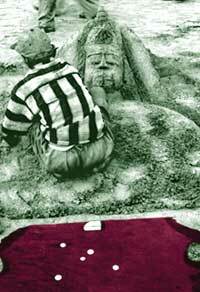 "Where else other than nullahs, rivulets and rivers such as Mithi, all of which empty into the sea. And it is wrong to only attack slums for polluting waterbodies. How much wastewater can a slum household generate, that hardly receives any drinking water supply? It is these housing societies/commercial complexes that are playing havoc with Mithi and government has turned a blind eye towards them," says Girish Raut, a Mumbai-based activist. "In Greater Bombay, dumping sites ... are located along creeks... waste is deposited below high tide level without any soil cover. The creek water gets polluted on account of direct contact with refuse and on account of leachate. The refuse...does not get decomposed even after 3 years." Mumbai generates between 7,000 and 7,800 tonnes per day (tpd) of waste. And, as a recent paper Waste management scenario in Mumbai: things can improve , by Rakesh Kumar, director of the Mumbai office of National Environmental Engineering Research Institute (neeri ) puts it: "Mumbai's waste management problems are unique... It has least available space, hence landfilling is not sustainable... Residential colonies are in close proximity to dumping grounds... And due to high commercial activity, volume of waste generated is also high. September 9, 2005. Panic gripped Mumbai, again. Within 24 hours the city received more than 200 mm rain. It started pouring heavily in the morning. By 11 am the unrelenting downpour caused traffic jams. Not leaving anything to chance, the state government issued a rain alert. With Terrible Tuesday (July 26) fresh in mind, people left offices. Schools were shut down. As everyone came on to the roads, or headed towards local train stations, the Bandra-Mahim highway, a major intersection joining suburbs with the island city, was chock-a-block with traffic. Within an hour or so of rain, low-lying areas like Kurla, Sion, Mahim, Dadar, Andheri, Goregaon and Bandra East were flooded. To avoid another public backlash, the state government evacuated close to 300 families. The infamous Air India colony of Kalina once again went under water. Services on Central Railway were suspended for about 3 hours. It is September 10 today, and the rain has still not relented. Most low-lying areas remain flooded and trains are running late. It is a holiday today and tomorrow, and people themselves are taking precautions not to venture out unless it's unavoidable. They know banking upon the government can be suicidal. Once bitten, twice shy! "First and foremost we need to protect Mumbai's natural drainage system and implement the crz regulations that restrict construction activities. fsi restrictions within crz ii zone should be strictly adhered to, and the 1991 crz rules implemented in their totality including the clause for a buffer zone. Projects such as bkc should not be cleared. Also there should be a check on permitting buildings that are constructed by blasting hiils," says Samant. "Rivers must not be channelised or forced to change course at the whim of a project," he adds. Raut agrees. He wants the remaining mangroves to be granted the status of protected forests: "Mangroves are more efficient in cleaning up Mumbai's sewage than the present expensive sewage treatment plants." • mmr's population will rise to 22.4 million by 2011. • Gross water demand for the region in 2011 will be 7,959 million litres daily (mld) as against the present supply of 3,922 mld. • By 2011, private vehicles will be more than double their 1991 levels. • Peak period passenger trips will increase from 21.55 lakh in 1991 to 32.6 lakh in 2011, with public transport accounting for 85 per cent of the trips. Kapil Gupta of iit Bombay agrees and says, "Bringing in more water will mean more wastewater problems." " mcgm is unable to handle the present amount of wastewater, with 40 per cent of Mumbai still not sewered. How logical is it to generate more sewage?" he questions. Various authorities/committees and fact-finding teams have been set up to revive Mithi river, but the recommendations of none are binding upon the government. So will they be of any help? There are also discussions on getting rid of the present cement mania. Almost the entire city is cemented and no way can the water seep into the ground. Parts of Mumbai are already facing a saline ingress. Hence, it is important that water percolates into the ground and recharges the groundwater. For this porous building blocks could be used. Gupta claims that such blocks are used in most industrialised countries. Mumbai needs to desperately protect its fast-dwindling open spaces. "Not only do these open spaces act as city lungs, but they are also holding ponds during heavy rainfall. Saltpan lands, which the state government wishes to open for construction activities serve exactly the same purpose and should be retained," says Samant. He accepts that reclamation is required, but says it should be done with care. "Reclamation can be done by either joining the low-lying islands or from the sea. Sea reclamation, though easy, is more expensive. First and foremost, wave patterns need to be studied and reclamation should be done in such a manner that the wave attack is not straight. Enough barriers should be put at the shore to absorb wave shocks." Land-use maps need to be prepared with local people's participation. "Most people do not even know the land-use plan of their area. Hence, politicians and builders get these plots reserved or dereserved keeping in mind the market conditions," says Krishnan. Other angry Mumbaikars suggest non-payment of taxes (worth Rs 58,000 crore a year) to the Centre; some even demand a separate state. They claim that Mumbai's residents should have the right to elect their chief minister, so that there is some accountability. But, there are hardly any public protests. It is this chalta hai attitude Mumbai needs to jettison. Hopefully, July 26 -- and now, September 9 -- will wake peopleup. For future's sake.